Eastern Virginia Medical School, Norfolk, VA 1999-2003 M.D. About Cyndi M. Torosky, M.D. Prior to medical school, Dr. Cyndi Torosky researched the use of gene therapy for cancers and organ transplants. She has been an investigator for Virginia Clinical Research and has been published in the Journal of the American Academy of Dermatology, Pediatric Dermatology, and Cutis. Dr. Torosky enjoys the variety that dermatology provides, including the treatment of skin cancer, sun damage, acne, rosacea, psoriasis, lupus of the skin, and hair/nail disorders. Her cosmetic interests include total facial rejuvenation with volume replacement/fillers (Juvederm, Voluma, Restylane, Radiesse, and Sculptra) and Botox/Xeomin for facial wrinkles. Other services include chemical peels, photo facials, and laser treatments. In her free time, Dr. Torosky enjoys downhill skiing, traveling, and spending time with family and friends. She resides in Virginia Beach with her husband Frank and their family. "Outstanding patient care. Dr. Torosky always takes the time for a thorough examination and interview. I always feel confident that my skin has been carefully checked and treated each visit." "The nurse that escorted me to the treatment room and the nurse that applied the topical numbing cream were both amazingly nice and attentive and Dr. Cyndi was beyond kind and professional. It was a great visit for me." "I felt very comfortable with my doctor as well as her assistant (nurse). I had to get 3 moles removed while I was there. The process was explained clearly to me and was easy, quick, and painless. 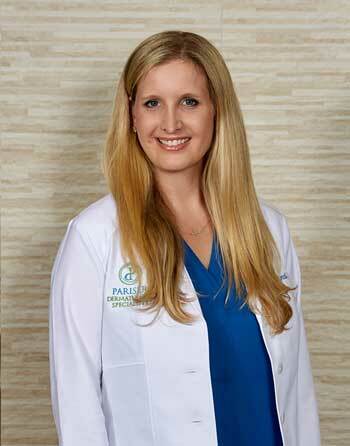 I am so glad I found Pariser Dermatology!" "Dr. Torosky was very empathetic and wonderful! She addressed my concerns and made me feel comfortable and at peace with my situation." "Love my doctor, she is very knowledgeable and informative."